It may seem strange for many people, but I never learned to swim. We lived in the country and driving "into town" to take swimming lessons wasn't a priority when I was growing up. As a result, neither me nor my siblings learned how to swim. It was always something in the back of my mind that I thought "I should really take some lessons". But, never got around to it. Last summer, Jo-Anne & I were at the beach with our families when the guys took a load of stuff to the vehicles. We were left with the boys on the shoreline. Not a big deal, but the waves were huge that day and they wanted to get in a few more before we had to leave. We were both uncomfortable with them being in the water since neither of us could swim. I think that was the moment I decided I needed to act. So, a few weeks ago I inquired at our local pool about adult lessons. I signed up and suited up. My instructor is great! By the end of my first lesson I was actually swimming! 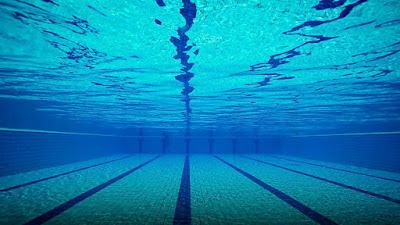 I must say, it is quite an unusual and amazing feeling to push off from the edge of the pool and feel my body hovering at the surface. I am now able to swim 15 meters! I don't expect to compete in any races or achieve any accolades, but conquering my fear of the water and learning to swim at 41 feels pretty good to me.